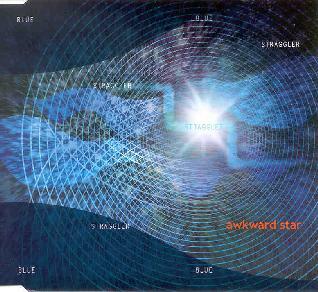 Awkward Star - "Blue Straggler"
From Seattle, Washington, Awkward Star play a seductive brand of ambient-funky-psychedelic jazz. The band consists of Rik Wright on guitar, Greta Nintzel on vocals, Mische Eddins on bass, and Randy Doak on drums. Eddins and Doak are a more than capable rhythm section, but what gives this ensemble its character is Nintzel's spoken word delivery and the variety of styles and creative gymnastics from Wright's guitar. David Torn is an obvious analogy, as is Robert Fripp, though Wright adds elements of funky spacey psychedelia to the mix. Listening to the music on Blue Straggler I was often reminded of San Francisco jazz tripsters Mushroom. Bits of Portland band Dahlia came to mind. And the grooves have a Can feel at times. The set opens with "Anthropologist", on which the rhythm section lays down a funky groove that guitarist Wright supports while injecting an element of psychedelia to the mix. Other highlights include "Nothing Spectacular" with its cool trip-funk feel. "B36" and "Anything That Moves" are effectively two parts of the same song, which results in a haunting and cosmic trip into Beat jazz space. "Fire" is similar, being highly space atmospheric with guitar efx that recall the earliest Kosmiche bands, but the grooves and cool Beat jazz vibe are ever present. "Dreamy Red Leatherette" is the most rockin track of the set. And "Buzz, Hello?" is my favorite song and the one that most reminded me of Can. Awkward Star lay down some totally cosmic grooves on this tune, Nintzel's spoken word has a gritty street feel, and Wright is everywhere at once, rocking out in space jazz heaven. Excellent! In summary, an intriguing set of tripped out jazz and funky psych grooves. Give this disc a close headphones listen to really appreciate all the inventive sounds and efx coming from Wright's guitar. I'd love to hear some of his other work. For more information you can visit the Awkward Star web site at: http://www.awkwardstar.com.